What does a professional storyteller do for a living? What makes up our days? Here is my attempt at keeping a picture blog of what I do everyday. One picture and post per day (or at least 5 per week) and some pithy comment. We'll see. Click >here<. for my real blog. 04.30.2008 Wednesday: Home Again. Jiggity Jig. 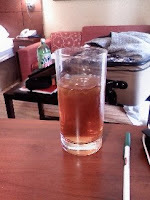 Picture of: my glass of hotel-room iced tea. Much like prison liquor, I make my own tea using the common household items you find in a hotel room. I shall blog that for you later. 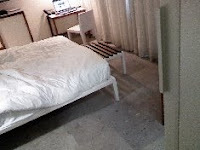 Picture of: my prison dorm-style hotel room in Miami Beach. Clearly these rooms are not designed with the sober in mind. I'll blog about it later. 04.28.2008 Monday: Fly to the Naked Beaches. 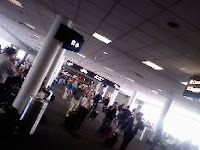 Picture of: the B6 gate at Charlotte NC airport between my flights. Today I: flew from Phoenix, AZ to Miami, Florida to present a corporate storytelling gig; had a Taxi driver that wanted to voluntarily inform me of every place I could find women and naked beaches in Miami Beach- told him that I was more interested in finding a place to eat after flying all day on diet coke and peanuts- he said he understood; checked into dungeon-esque room in Miami Beach- creepy; trying Internet connections, but they don't work well down here in the basement/alley/service hallway. I hope this actually posts. Picture of: my suitcase staging area, clothes and Kinko's box. 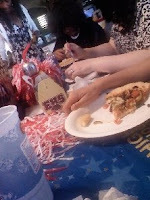 Picture of: the table at a family party today. Today I: returned the rental car; participated in a family party; got beat over the head with my FMS; watched the Depp "Sweeney Todd-" much better than I had hoped for; not a good storytelling business day, but these days are okay, too, considering I will be 24/7 Monday-Wednesday. 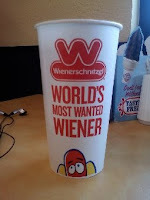 Picture of: the "world's most wanted wiener" cup. Today I: picked up a rental car for a few projects; had an early lunch with daughters #3 and #4- daughter #4, who we have nicknamed Miss Adventure, was fascinated to find out there were fast-food places that specialized in just hot dogs-hilarity ensued; had a coaching session with a corporate storytelling client helping him to fine-tune his story of his business success so far followed by lunch with same client. Great session with a client who really understands how corporate storytelling works. Coaching people is both "drawing out" and "adding in" if the two are that different; waded through Emails; worked on itinerary changes for next week's trip; listened to some of the huge stack of CD's I need to go through; late dinner with family. 04.23.2008 Wednesday: School Show Guantlet. 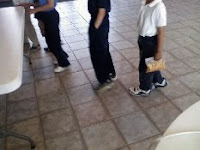 Picture of: little kids and their snacks shuffle into one of my school shows yesterday. 04.22.2008 Tuesday: I've Got Gas. 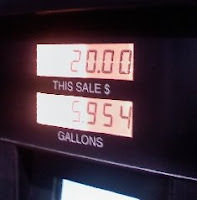 Picture of: less than six gallons for $20. Sheesh. Today I: started with an early morning conference call about next week's Miami corporate storytelling training event I am presenting- three hour time differences mean I start early! ; sent out storytellingproducts.com orders; returned the rental car; brunched with several children and my wife; did some background updates to storyteller.net; did the daily bank/post office run; had a great conference call with participants who attended the first Outside In Storytelling Marketing Boot Camp. You must join us in August; ran out with daughter #4 late night to put gas in the tank of the van tonight so I would not have to do it in the morning before the school shows. 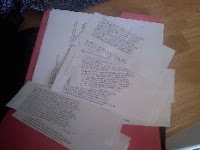 Picture of: the story of Iron John all cut up in pieces. 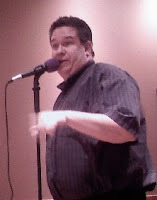 Picture of: me performing at the http://www.storytellingatborders.com event tonight in Avondale, AZ. Today I: sorted through and updated my storytelling; wrote a new blog post; worked on two new stories for Borders tonight- if nothing else, the Borders event (three years now) requires that I learn new stories every month; had lunch with daughters #1 and #3; packed up the equipment for the show; performed at Borders to one of our larger crowds; had the traditional after-Borders meal with my wife, mother and children; this event is now "dark" until September, we'll see if we resurrect it. 04.17.2008 Thursday: There and Back Again. 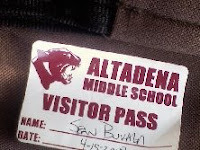 Picture of: my visitor pass for my wandering around the halls of the middle school. 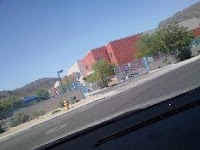 Picture of: the drive up to the school where I performed two shows today. Today I: did a set of early morning runs to the bank and post office; talked with a future sponsor on the phone; sent a contract; packed up and travelled to the school shows; set up, performed and did the strike for the two school shows; worked on new products for the store; dealt with a messed up bank check; did some research for a new Pandora story; calling it an early night as the cold medicine does its magic. 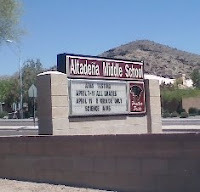 Picture of: the school sign outside the school where I am working a few days over the next week. 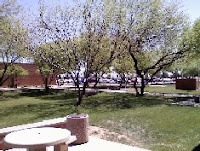 Picture of: the campus at Glendale Community College, AZ where I was filling in as a guest speaker for a Storytelling 101 class. Today I: made copies of workshop materials; had a staff meeting; picked up the rental car (I am at the highest super-duper First preferred service with Avis); ran said copies to Kinko's for more copying; worked with wife #1 to make handout packages; travelled to and did a guest speaker/sub teacher visit for a community college storytelling (read that "humanities credit") class; read with great interest the postings on the wall of elementary school teachers-to-be- I hope you aren't burned out of your enthusiasm in less than a year, my friends; dealt with a temperamental Internet connection at home; did the post office run; decided to take an extension on my 1040; researched for reminding some Greek myths; worked with my wife to pick up 8 brooms for the storytelling classes this week; missed the Arizona Storytelling Guild meeting; printed out maps and GPS for the school(s) I am working with this week; Twittered; picked up meds from the drugstore. Glad they are open at 10PM. 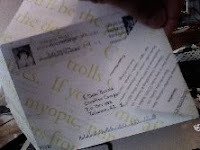 Picture of: interesting piece of mail that I received from Megan Hicks. She is a storyteller and an Origami master. 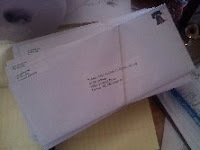 Her envelope both shows her craft and contains promotional info as part of the paper. Well Done. Today I: sorted through Saturday's mail; went to the bank with checks from Saturday; prepared notes for Monday's guest speaker piece at GCC; packed up mail from Storytellingproducts.com; had lunch with my wife and kids; talked on the phone with a sponsor for the upcoming weeks events; prepared invoice for another sponsor; spoke with Tom Taylor in Texas about our upcoming "Storyteller.net Live!" event in Austin Texas next month. 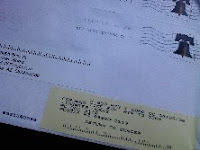 Picture of: some returned mail, with those nifty yellow address updates that the post office provides. Today I: spoke with clients on the phone; arranged billing for a client; sent purge letters to storyteller.net basic page members; post office run; updated my mailing list- do you know the three major divisions you need in your mailing lists? I do. ; talked Robert Frost with another student in my degree program; packed up some storytellingproducts.com orders; booked a rental car; transported kids around; chased a "scary" bug out of daughter #3's room; sent a contract to a client; answered a lot of email; watched BSG. 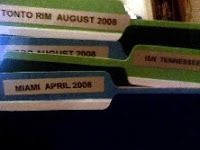 Picture of: several of my GTD files all freshly labeled. 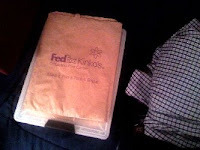 Picture of: one of my media kit packed up, printed, postaged and ready to go to the post office. Today I: prepared and packed up several kits to potential sponsors; booked hotel room for future event; made the daily post office trip; spoke to a client about upcoming Houston storytelling event; registered people for the "Storyteller.net Live!" event in Austin; made a second post office trip; spent time on the phone with a few other storytellers; sent orders from Storytellingproducts.com; ordered more inventory; prepared a few more mailings and continued to update my mailing lists. 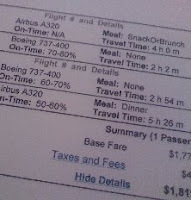 Picture of: one of the itineraries I booked today. Today I: had a staff meeting; took packages to the post office; talked on the phone with one of my summer storytelling sponsors; faxed back contracts; did banking; booked multiple flights for future events; worked on another mailing; updated my mailing list; contacted one of my booking-agent people; sorted through a pile of things that needed to be GTD'd; took storytellingproducts.com orders; helped some people with their storyteller.net pages; read some interesting postings that convince me even more that Storytelling is going into the direction of voiceover with the foundational struggle and problems that industry is having; became more convinced than ever that the Outside In Model is very true. 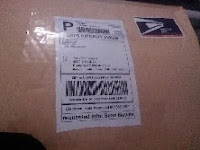 Picture of: stack of mail bundled and banded for mailing. Today I: took a deep breath as I have been to busy to blog and Twitter; finished up the mailing for local events; had lunch with daughters #1 and #3; printed flyers at Kinkos; packed up said flyers in box for shipping; packaged up Storytellingproducts.com orders; ate dinner with my wife; began research on stories I will need for a couple of big events next week. 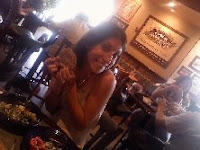 Picture of: my friend Gina who is very excited about the cookie she is going to eat. Today I: returned the rental car I had to use this weekend; worked on a new mailing to western states; met for lunch with Gina- a young woman who was in one of my youth groups many many years ago and is now moving on to exciting new out of state adventures with her husband (best of luck Gina- this is exciting); reviewed Emails from a corporate storytelling sponsor and ran them through my "interpret, express, integrate" process to create a basic proposal idea for them; went to the bank and the post office; took daughter #1 to work and back again; found my GTD notebook and began a fresh new mind sweep; created new voiceover scripts for David Ian Davies to record for the upcoming podcast beds- David does BRILLIANT audiobooks of Sherlock Holmes stories; spoke on the phone with the sponsor for Wednesday's school shows; didn't send out expiration notices to Storyteller.net members as I was afraid they'd take it as an April Fools jokes; reviewed all of my 2008pics.com postings and realized I have so far met my goal of # of postings- yay me. Sean Buvala is a publisher and storyteller living in Arizona. He's an author for The Small Tooth Dog Publishing Group. Sean has worked in nearly every type of industry presenting advanced thinking in the art of communication via oral storytelling.